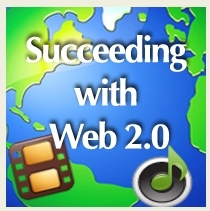 Succeeding with Web 2.0 Projects-Special Guest: Terry Freedman - Classroom 2.0 LIVE! I enjoyed taking part in this. Unable to multitask effectively when giving a presentation (can anyone? ), I am gradually catching up with the comments on screen as I listen and watch the recording in bits each day. The presentation looks at the factors which help to make a (web 2.0) project successful, and includes (mainly) a case study of a multimedia project, and info taken from the forthcoming Web 2.0 Projects ebook. Thanks to Peggy, Kim and Lorna for their support before, during and after the session.